Soil and bioclimatic factors constitute key factors that influence the interaction between host plants and broomrape. 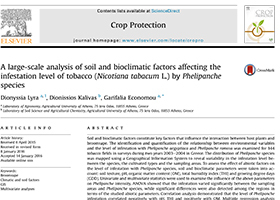 The identification and quantification of the relationship between environmental variables and the level of infestation with Phelipanche aegyptiaca and Phelipanche ramosa was examined for 144 tobacco fields in surveys during two years 2003e2004 in Greece. The distribution of Phelipanche species was mapped using a Geographical Information System to reveal variability in the infestation level between the species, the cultivated types and the sampling areas. To assess the effect of abiotic factors on the level of infestation with Phelipanche species, soil and bioclimatic parameters were taken into account: soil texture, pH, organic matter content (OM), total humidity index (THI) and growing degree days (GDD). Univariate and multivariate statistics were used to examine the influence of the above parameters on Phelipanche intensity. ANOVA showed that the infestation varied significantly between the sampling areas and Phelipanche species, while significant differences were also detected among the regions in terms of the studied abiotic parameters. Correlation analysis demonstrated that the level of Phelipanche infestation correlated negatively with pH, THI and positively with OM. Multiple regression analysis suggested that soil and climatic variables together explained 63% of the infestation variance. Discriminant functions accounted for 90% of the total variation in the dataset. All statistical analyses demonstrated that pH, THI and OM were the most decisive variables for the severity of infestation. The two Phelipanche species were clearly discriminated, with P. ramosa being found at higher and P. aegyptiaca at a lower level of infestation. A parasitism specification was also observed between the two Phelipanche species and tobacco types. The findings provide constructive information for modelling broomrape infestation based on abiotic factors and create a baseline for future monitoring of broomrape distribution.